B.A. (Hons.) University of Ballarat, 2008. I found the surrealist Manifesto about ‘Mark Making’ while studying and found by making marks combined with the use of color, my ideas could begin to take shape and the marks opened up a genuine dialogue for me. This form of visual communication has led to some unique compositions. I paint in oil and acrylics, using gestural line with the interest of developing an illusion of depth and space. I am experimenting with my choice of colors to help me achieve that goal and find this to be an authentic approach. I see my line work as a continuation of my drawing skills. I like paint to behave as paint, so I like the rough, untidy, gestural and spontaneous brush strokes. I enjoy the magic that seems to come about as I work. I have recently returned to portraiture. My current goal is to modernize my portrait and figure painting by utilizing an abstract under-painting and layering it with multiple colored lines, using light and shade to highlight drawings with just a touch of realism. I’ve recently begun to experiment with features and emotions combining abstract line and portraiture. I have found mark making, line work and use of colour has lead me through my own history, loves, life and beliefs. I really love what I do. Born in London’s Islington in 1949, Dawn Lim spent most of her child-hood with her Grandparents in London. Though she has a vivid pictorial memory, the urban landscape there did little to inspire her. All she recalls is buildings that cut off the sky. The very first person she remembers drawing was a Chinese character from the new invention of Television. She figures this is probably why she later fell in love with her Malaysian Chinese husband Chai. As a young girl, Dawn drew countless people, mostly neighboring children, as well as dogs and horses. She loved the feel of graphite on paper and oil paint. 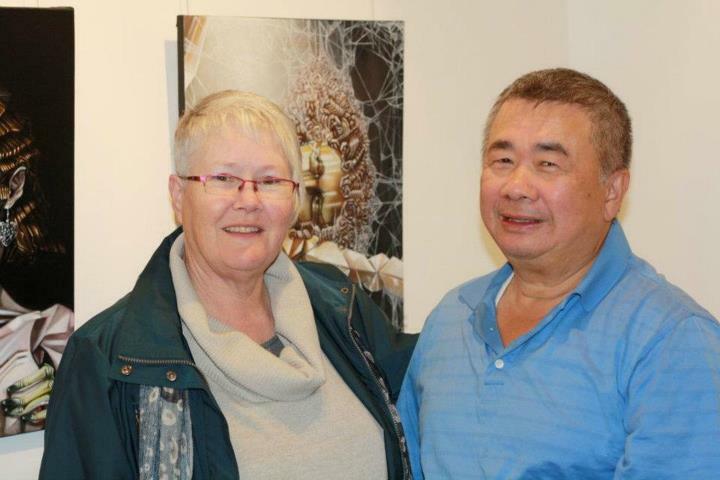 Soon after arriving in Melbourne, Dawn met her future husband, Chai Chin Lim, and in 1979 they married in the New Zealand Temple of the Church of Jesus Christ of Latter Day Saints. Dawn and Chai lived in Melbourne for a while, and moved to Amphitheater in the Pyrenees Shire 1989. It was Chai who encouraged her to attend University, and their union has been a great blessing in her life. They moved to Ballarat in 1993, so Dawn could study. Dawn graduated with a Bachelor of Arts (majoring in painting) in 1996, at the University of Ballarat. Being a mature age student, this qualification was a real highlight for her, and opened up the pathway for a new beginning professionally. She went on to achieve a scholarship to undertake her Honours year in 2008. By September 2013, Dawn had multiple digital works on show in New York City and at Scope Miami., and received various offers to show her work around the world. Dawn is committed to working privately in the arts, exhibiting and teaching. I’m searching to get a qualified author, lengthy time in this location. Outstanding write-up!